Back in June, Citrix ended XenApp 6.5. As a result, some customers decided to stay with it and risk moving forward with no support, while some have decided to continue to spend the time and money to make the upgrades. But, some were able to find other solutions that were a better long-term fit. While there are several choices out there, a Citrix alternative that can be implemented today is MyCloudIT. Not only can it be implemented within a few hours, but it can replace Citrix XenApp and XenDesktop. Who doesn’t want to save money? 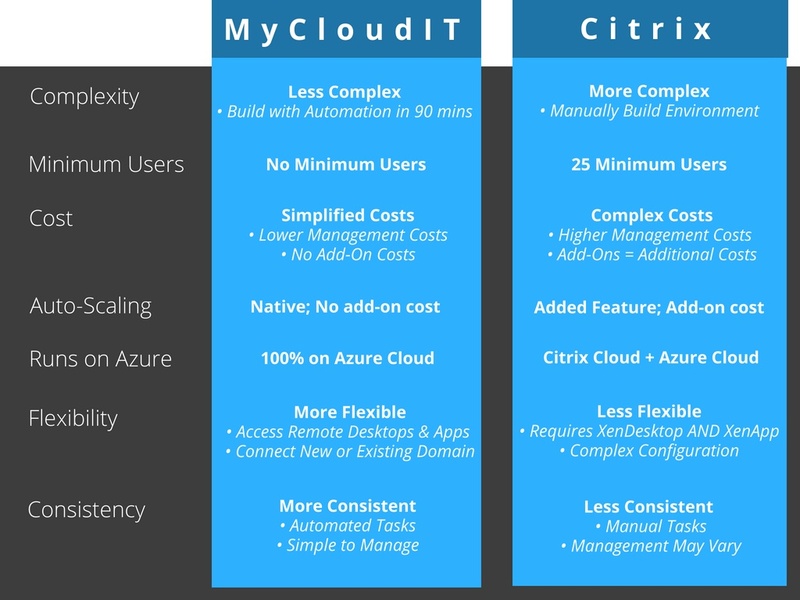 Check out the chart below to give you a better idea of the differences between Citrix and MyCloudIT. From automation to management, MyCloudIT can provide a less complex tool so you can get back to what matters, your business. Looking for more information on Citrix XenApp vs MyCloudIT? Check out this past blog comparison after Microsoft retired Azure RemoteApp.